Joint spacing influences internal slab stresses, which determine how and where a slab cracks, as well as how much a slab will shrink or expand with temperature changes. Typically, joint spacing decisions must be made on JPCP transverse and longitudinal contraction joints. Of these, transverse contraction joints involve the most options. Longitudinal joints are typically spaced at lane edges, which makes them between about 3 and 4.25 m (10 and 14 ft.) apart. Expansion joints are rarely used any more, and construction and isolation joints are determined by project geometry, field placement and equipment capabilities. Joint spacing is highly dependent on the local environment, materials and subgrade. First, expected temperature changes will influence slab curling stresses. In general, the greater the temperature changes, the shorter the joint spacing should be. Second, the materials within the PCC slab (the coarse aggregate is of overriding concern) will influence the slab’s thermal coefficient. The higher the thermal coefficient, the more a slab will shrink and expand for a given temperature change. Generally, slabs made with limestone coarse aggregate have lower thermal coefficients, while slabs made with quartz or sandstone have higher thermal coefficients. Third, as the slab expands and contracts, the frictional resistance offered by the base material will also influence slab stresses. In general, the more frictional resistance, the higher the slab stresses. Joint spacing is also related to slab thickness. In general, the thinner a slab is, the higher the curling stresses and thus, the shorter the joint spacing should be. As a general rule-of-thumb, joint spacing should be less than about 24 x slab thickness. Thus, a 230 mm slab (9 inches) should have joints spaced no more than about 5.5 m (18 ft.) apart. Also, as a general guide, the ratio of longer side slab length to the shorter side slab length should be kept less than about 1.25. The FHWA (1990) recommends that the L/l ratio (slab length divided by radius of relative stiffness) not exceed 5.0 when determining the maximum slab length. Table 1 shows some slab lengths resulting from using L/l = 5.0 for a range of normal slab thicknesses. Skewed transverse contraction joints can reduce load transfer joint stresses and may be beneficial in undoweled JPCP. Typically, joint skew should be limited to a maximum of 1:10 to prevent excessive corner breaks (see Figure 1) (FHWA, 1999). Figure 1. Skewed joint showing a corner break. Joint width and depth are dependent on two separate things. First, joint depth should be between 1/4 and 1/3 of the total slab depth to ensure crack formation at the joint. Joints shallower than this may not sufficiently weaken the vertical plane. Second, joint width is selected to provide an adequate joint sealant reservoir. Typically, a contraction joint is first sawed very narrow (3 mm (0.125 inches)) to control cracking, then later widened (10 – 15 mm (0.4 – 0.6 inches) wide) to create a joint sealant reservoir (FHWA, 1999). Estimate the total joint movement using the slab shrinkage/expansion equation. Determine the reservoir width based on the joint sealant to be used. Hot pour liquid sealant / silicone sealant. Dependent upon the estimated joint opening, the allowable sealant strain and a sealant shape factor. The shape factor is used to determine the required depth of sealant. For example, if the required joint width is 12.5 mm (0.5 inches), and the shape factor is 1:1, then the depth is 12. 5 mm (0.5 inches). Compression sealant. The uncompressed seal width (USW) should be selected based upon the anticipated joint openings and the maximum and minimum recommended compression of the seal (generally 0.5 and 0.2, respectively). The sawcut width is determined based on the anticipated state of compression of the seal at the time of compression, which is based largely on the expected temperature range and the installation temperature. A degree of load transfer between slabs may be provided by aggregate interlock, which is the mechanical locking which forms between the fractured surfaces along the crack below the joint saw cut (Figure 2) (ACPA, 2001). Some low-volume and secondary road systems rely entirely on aggregate interlock to provide load transfer although it is generally not adequate to provide long-term load transfer for high traffic (and especially truck) volumes. 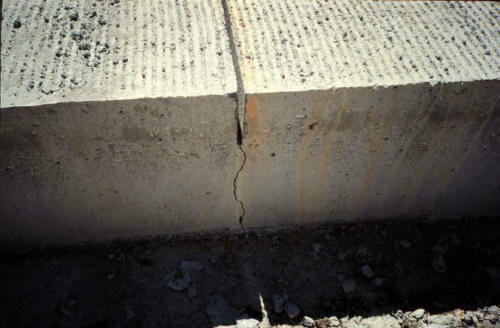 Aggregate interlock is ineffective in cracks wider than about 0.9 mm (0.035 inches) and generally unable to accommodate typical slab edge stresses at transverse joints associated with medium to high traffic loading (FHWA, 1990). Dowel bars are used to provide the majority of load transfer on pavements that experience heavier loads, and must typically be designed into all medium to high volume rigid pavements. 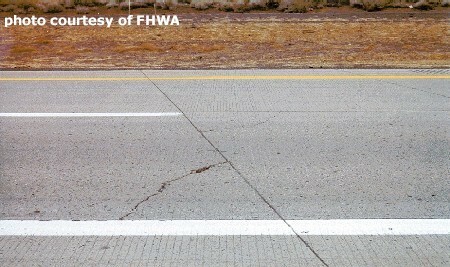 The FHWA (1990) recommends the use of dowel bars. Further it recommends that they have a minimum diameter of 1/8 the pavement thickness, but not less than 32 mm (1.25 inches). Typical designs use 460 mm (18 inch) long dowel bars at 305 mm (12 inch) on center spacing, placed at slab mid-depth.